This timely 328 page, 8 1/2" by 5 1/2" novel/tutorial investment program is comb-bound with durable, laminated covers. 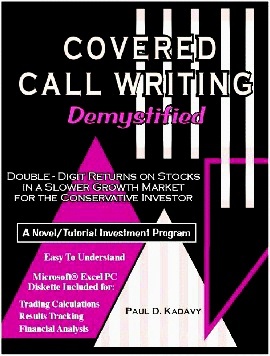 COVERED CALL WRITING DEMYSTIFIED is the first book to simplify, fully explain and instruct investors on how to use covered call option writing with common stocks and Exchange Traded Funds. It offers what may well be one of the best opportunities to achieve double-digit investment returns from the slow-growth stock market experts expect in the future. Please tour our site to learn about the problem of a slower growth stock market, the solution to the problem, the benefits of covered call option writing and sample calculations. Read the author's preface, about the author and much more.